Board a double-decker bus for a guided, 2-hour night tour of historic Philadelphia. This evening sightseeing tour around the 'City of Brotherly Love' departs at 8pm every night. It's a great way to discover many of the city's popular attractions and landmarks, like the Liberty Bell, Independence Hall, Penn's Landing, the Philadelphia Museum of Art, and much more. Soak up the history, heritage, and beauty of one of America's oldest and most beloved cities. 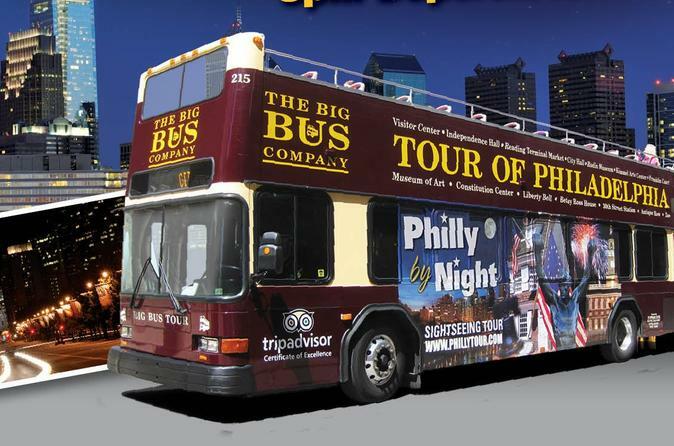 For a fun and informative overview on the city of Philadelphia, take the 'Philly By Night' double-decker bus tour. This 2-hour adventure offers a different perspective on the 'City of Brotherly Love' in the evening, with all the attractions and landmark locations lit up under the night sky.